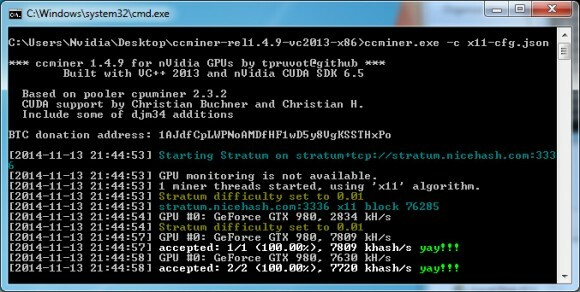 The ccMiner for Nvidia GPU mining for crypto coins is finally getting more like cgminer for AMD in terms of supported features thanks to developers like tpruvot. The more recent versions including the latest 1.4.9 of his ccMiner fork (source) have introduced features such as the ability to control the intensity of the GPU load, basic API functionality to get stats available to other software, support for JSON-based config file and now also nvapi/nvml support for GPU monitoring and possibly control. We have compiled a Windows binary from the latest source since there is still no official one released with the latest features and you can find a link to download it below. The binary is compiled with VS2013 and CUDA 6.5, however it includes support for Compute 3.0, Compute 3.5, Compute 5.0 and Compute 5.2 GPUs and not only for the new Maxwell-based cards. The latest version also does include some of the optimizations from SP’s ccMiner fork optimized for Maxwell, so you can expect to get similar performance on Maxwell cards such as GTX 750 Ti or GTX 970/980 with this release from tpruvot. The only thing that we still haven’t figured out is how to make GPU monitoring work as we are getting an error message saying that it i not available. Update: There is now an official release of 1.4.9 available with some additional fixes and changes in the API, so you can download it directly from tpruvot’s Github repository, link below is updated to point to it.